Sub : Implementation of the recommendations of the Seventh Central Pay Commission on Dress Allowance. Vide Board's letter F. No. PC-VII/2017/l/7/5/7 dated 03.10.2017 circulated as RBE No. 141/2017, Government's decision on payment of Dress Allowance at specified rates annually to eligible categories of employees, was notified. 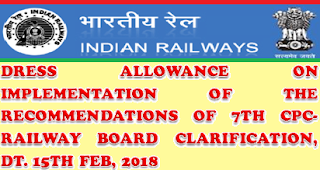 It was mentioned in the circular that this Dress Allowance would be in lieu of basic uniform and uniform-related allowances hitherto supplied/paid to Railway employees. The orders were specifically mentioned as taking effect from 01.07.2017. 2. 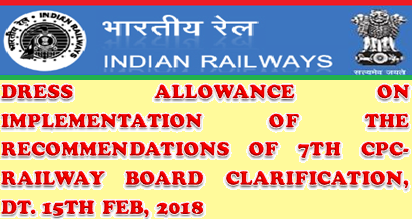 Two Railways (VCR and SECR) have now raised queries on whether Uniform stock already finalised/under finalisation for procurement in some categories should lead to non-payment of the Dress Allowance due from July, 2017. In this context, it is pointed out that the 7th CPC recommendations on Dress Allowance (Chapter 8.16 of the 7th CPC Report) did not comment on liquidation of uniform stock procured/under procurement prior to payment of Dress Allowance to eligible categories of employees. The Ministry of Finance's OM dated 02.08.2017 that notified implementation of this accepted recommendation also did not have any caveat on Dress Allowance not having to be paid with effect from July, 2017 to cater to procurement processes of uniforms already initiated as on the date of notification of the said OM. Accordingly, RBE No. 141/2017 also did not specify any such caveat while notifying the date of effect of the orders as 01.07.2017. 3. If any Railway/PU is unable to make payment of Dress Allowance in terms of RBE No. 141/2017 and desires a review of existing instructions on the matter, it may send a comprehensive proposal in this regard with the concurrence of PFA and approval of the GM, to enable the matter to be put up to Board.